Nestle's Story! 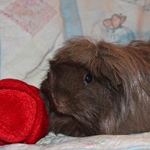 Nestle is a stunning chocolate colored Peruvian girl who was used a breeder before coming into rescue. Her fur is so fluffy, it's hard to tell if she is coming or going! Nestle was in poor health when she arrived in the fall of 2011. She was terribly underweight, with missing fur, noisy breathing, and sore feet. We were not sure of her age, but guess she was 2 or 3 yrs. old at that time. Within a short time, with lots of TLC along with a healthy diet, Nestle was gaining weight and her fur was growing back, but her noisy breathing suddenly worsened dramatically. She had a severe case of pneumonia, and her foster mom was afraid she might not survive. Thanks to two kinds of antibiotics, nebulizer treatments with more medicines, and hand feeding Critical Care around the clock, Nestle began to improve! Within 10 days she was back to her perky self, with just a slight noise in her breathing. A few months later, her noises worsened, and her eyes were crusty. 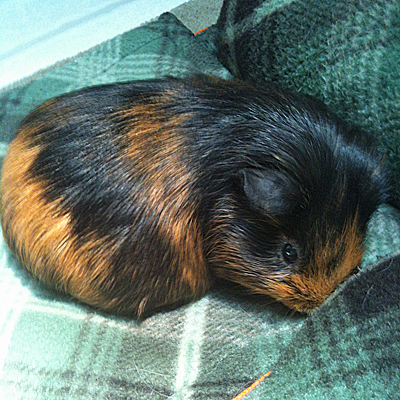 Another trip to our wonderful vet revealed a heart problem that was affecting Nestle's breathing as well as her heart. She began taking daily medications to help her combat congestive heart failure, with antibiotics as needed to take care of the occasional flare up of secondary upper respiratory illness. Because of previous bouts of infections, likely untreated prior to coming into rescue, Nestle had lung scarring that is permanent. Her medical status meant she would stay as a Sanctuary animal within Wee Companions for the rest of her life. Nestle lives with a herd of other girls, many with special medical needs, and their fearless leader, Valentino, a neutered male, who serves as peacekeeper and supervisor. Roland's Story! This handsome chunk of boarlie, who absolutely knows he's gorgeous, is Roland. Roland was born in 2008 and has lived within Wee Companions for about two years. Roland was a sweet boy, but his foster homes found he got sick often. Thus, through WC's foster home hierarchy, he arrived at WC's heart specialist foster home, hoping maybe his new home could help him thrive. The day he arrived, his new mama and him went to the vet. Why? Because mama had a hunch. And you know what? She was right! X-rays showed that Roland should have been named Frankenstein! Roland's whole left side is roughly 1-2cm shorter than his right! His joins were riddled with arthritis because of his shortcomings, and his poor heart was under distress because his body hurt. Now, Roland is a happy boy, that runs (!! ), talks incessantly, begs for veggies, and hasn't been sick in months! Roland has to take a lot of medicines to counteract his mismatched parts, so even though he's younger, he will remain with his heart loving foster mama. Tessler's Story! His name makes you smile, and so does Tessler himself! Tessler was brought to Wee Companions in the fall of 2011. He came to us on moldy bedding with birdseed to eat. When the Director of WC scooped him up, she found him to be a tiny adolescent who was so emaciated he was skin and bones, and wheezing so badly he couldn't breathe. She immediately took him to WC's heart specialist foster home, just to check. Tessler's new mama scooped him up, declared he was a heart pig with pneumonia and cradled his little self to Cote Hospital. Amazingly, Harvey Tessler had his first birthday this July! He is still a small guinea, but he runs, plays with his wicker bell ball, sits on his nanny boar's head, defends the weaker in his house, licks your fingers, spits out his medicine, uses humans as a jungle-gym, and wheezes/burbles/purrs the whole way through! Because Tessler is so vivacious, he is currently helping science advance in animal heart treatments, with regular check ups and "interviews" with vets! Tessler is so full of life, he refuses to let a heart condition slow him down (that's also why his picture is slightly blurry)!! 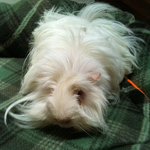 This white mop is Cirrus, due to his wispy white locks! Cirrus is actually a full blooded Peruvian, but in this photo he's donning his summer haircut. When Cirrus arrived at Wee Companions, his hair was matted and brittle, his eyes were almost crusted shut, he was filthy, and painfully skinny. 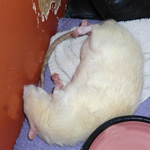 On a healthy diet and after a lengthy bath, Cirrus began his road to recovery. As Cirrus improved, and his foster mama was blown away that his hair got longer and longer, it was realized that Cirrus is quite old. Though no one is really sure of his age, Cirrus moves like an ancient boar. But, don't let that fool you, because when it comes to veggie time or making friends, he moves like he's 3 months old again. Aside from always having a friend, one of the things that has significantly aided in Cirrus's health is allergy medicine! Cirrus is allergic to hay pollen! Imagine that, being allergic to what you eat! After the battery of tests that brought us to this conclusion and getting him into a routine of medicines, Cirrus is now healthy, happy, and loves to boss around the young whippersnappers! Meet Larissa! Don't be fooled by the adorable snub nose and butterfly eye markings, she's got quite the personality and knows she reigns supreme! In July 2011, Larissa was born into Wee Companions. From the moment she entered into this world, she was different. While others ran, she walked. While others breathed silently, she wheezed and hooted. Through the diligent efforts of WC's nursemaid foster mama, Larissa, survived until weaning and was transferred to her current foster home, who is also WC's heart specialist. Larissa's new mommy took one listen and knew she had a special heart pig in her hands! Off to Dr. Cotes! Indeed, Larissa was born with a heart two times too big! 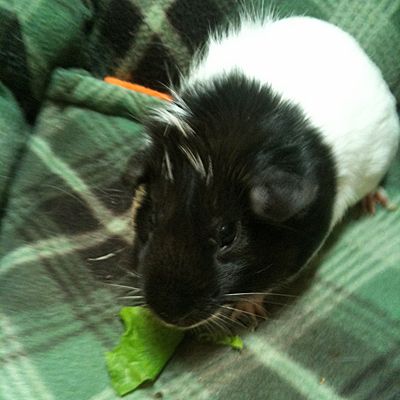 Her mama was told guineas with hearts like that don't live past their formative months. That was one year ago! With vigilant medicine and an entire team who love her, Larissa has grown into a beautiful young guinea girl. She wrinkles her nose in disgust should an unworthy veggie pass by and trots off with the veggies that peak her interest. Hooting at the world as she embraces life, Larissa is looking forward to another great year! Ciao a tutti! My name is Franco and I like to sleep a lot. Hey, I'm older, so it's OK, right? My sanctuary momma says I scare her when I sleep, but little does she know how very comfortable it is to sleep on my back with my feet up in the air. Ah, so comfy! I might have to teach my momma how to do that. When I dream of my momma, I wiggle my toes because I love her so much! She knows the right spot for a massage, I am so happy when she holds me, and also when I get to spend hours at a time on the couch. I just love my life! Che bella vita! My momma is the one who picked up me after I ended up in the shelter. I was so scared, I didn't really show my true self, but regardless, she held me and trusted me right away. I was adopted out by Wee Companions in September 2011 and returned a few months later. I am so glad my momma took me back right away! I don't know why, but she kept trying to find a forever home for me again. Little did she know, my heart was home with her the moment she trusted me at the shelter and gave me comfort. I am an old boy now and am home here - nowhere else. Bubba is about 2.5 years old and has been in our sanctuary care since March 2012. He was relinquished along with his brother who sadly passed away a few weeks ago. 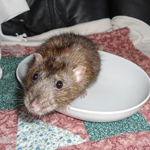 When Bubba came into our care, he weighed 885g, which is morbidly obese for a rat his size. He could barely walk, could not lift his feet, and was breathing heavily. His foster mom exercised him daily and offered healthy treats such as blueberries, bok choy, and other pieces of vegetables along with healthy lab blocks. Once Bubba started to shed some weight, his breathing improved and he started to play on the couch. Every night, Bubba gets to spend time on the couch where he loves to eat, drink and take a little nap. Sadly, Bubba won't accept another rat as his companion. Bubba is in sanctuary care due to his age, his initially poor health, and behavioral issues. In Bubba's world, his sanctuary momma is his servant and maid while his sanctuary daddy is the best thing ever! Hope came to us from another rescue in California. She had a pretty severe head tilt and some neurological problems that cause her to run in circles for brief periods of time throughout the day. We noticed she was losing weight and moved her to a foster home for closer monitoring. 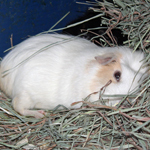 She joined a herd of guinea pigs, many of whom also have special needs, AND we figured out Hope is blind! She actually compensates very well. 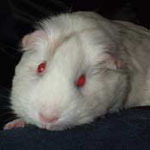 Now that she is living with a few other blind piggies, including Cheesecake, she has gained weight and gets along very well with her cagemates. Hope and her foster “sisters” all have various challenges, but are normally very patient with each other. Their “leader” is a neutered boar without any special needs, Valentino, and he quietly keeps the peace among the girls by stepping in between any brewing disagreements. It is truly an amazing herd to observe and see how they interact as a family group. 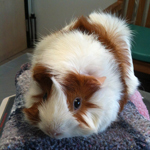 Cheesecake, the 5,000th animal rescued by Wee Companions, is a guinea pig that came to us with a residual head tilt after two courses of antibiotics. After observing her behavior, we suspected some other issues. The vet confirmed that Cheesecake is basically blind and deaf. She may see some differences between light and dark. Although Cheesecake does make fairly normal guinea pig sounds, the volume is always quite low, and she was very reserved, almost lethargic. We were concerned about that so we introduced her to another guinea pig. She came to life after they sniffed each other! We watched her popcorn and run all around their pen, then they stopped long enough to share some hay, before taking off to play chase again. 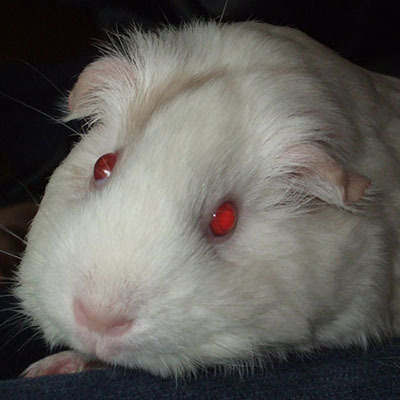 Cheesecake now lives with a group of “special needs” guinea pigs.